Day 183: A Day Chock Full of Stuff . . . So, today was a super fantastic day because we got to spend it with Daughter #2 in her neck of the woods – there is nothing better than hanging out with your kids. Seems like no matter how much older they get – a few precious hours is like gold. Whenever you get the chance, stop and hug your children – they are precious gifts from God entrusted to us. It was so great to be able to just visit, walk the mall and overall just hangout with D#2 – something we don’t get to do because she goes to school a distance from us. The cold chill of Boston caused these thin skinned Texans to don heavy coats, but we survived – hopefully the snow forecast for tomorrow won’t be overwhelming. Today is notable for two other reasons – it’s the birthday of Theodor Seuss Geise – otherwise known as Dr. Seuss and it’s Texas Independence Day – – – who knew! You just can’t be a parent and not LOVE Dr. Seuss. Growing up, we read countless times – “The Cat in the Hat”, “One Fish, Two Fish, Red Fish, Blue Fish” or even “Green Eggs and Ham” – would you, could you . . . what’s this about a boat and a goat???? – there is none better. Daughter #1 and Daughter #2 continue to be huge fans as well, and to this day won’t let us get rid of these books. Many life lessons are intertwined with what seems like childish babble. Next up is Texas Independence Day – WOW! The Texas Declaration of Independence was the formal declaration of independence of the Republic of Texas from Mexico in the Texas Revolution. It was adopted at the Convention of 1836 at Washington-on-the-Brazos on March 2, 1836, and formally signed the following day. What an exciting day to be a Texan!!!!!! Like many that reside in the Lone Star State, we weren’t born here – but got here as soon as we could. God Bless Texas! So, it was a BIG day that calls for a BIG wine!!! 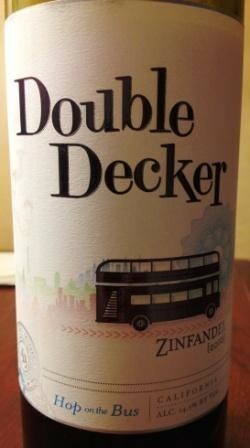 We stopped by a local establishment a picked up a 2010 Double Decker Zinfandel. This wine is a tasty little wine – don’t let the screw cap fool you. It’s full of fruit and oak – it’s ripe for any impromptu events where you might have forgotten a corkscrew. The nose is a sneak preview to the taste – while not as big as some other Zins we’ve had, it held its own. With easy drinking flavors of blackberries and fresh raspberry jam it’s an easy pairing for anything that has a smoky bite to it – like a burger or BBQ. The finish is ok, long enough to make an impression on us and well worth the less than $13 per bottle we paid. While it’s not a huge, full-body wine that carries the weight of a Dr. Seuss or Texas – it is a nice little number to enjoy on a Saturday night in Boston, Mass. Yes, we just might purchase again – if we could ever find it in our usual haunts. Been a long, great day – with more fun on the horizon tomorrow when we hook up with good friends up here in the east. Until then – enjoy your Saturday night, be thankful for your freedoms and take time to read a Dr. Seuss book to your child, grandchild or just read it to yourself – many lessons await! Remember to always enjoy responsibly and recycle whenever possible! Categories: Uncategorized | Tags: Double Decker Wine, Dr. Seuss, Texas Independence Da | Permalink.